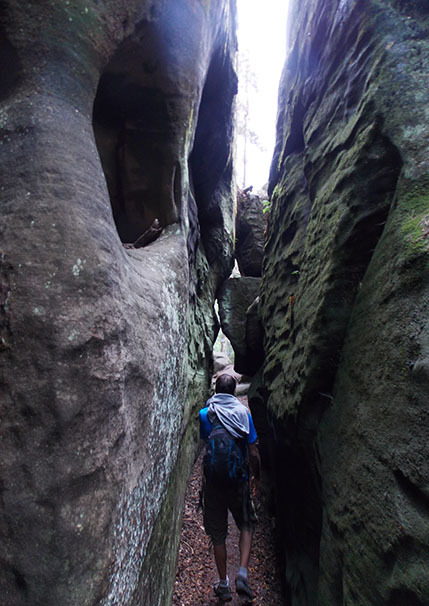 In the Bohemian Paradise there are routes of fine sand, sand that fall from dozens of rocks giving way to cracks and passageways that take you through the Rock Towns. 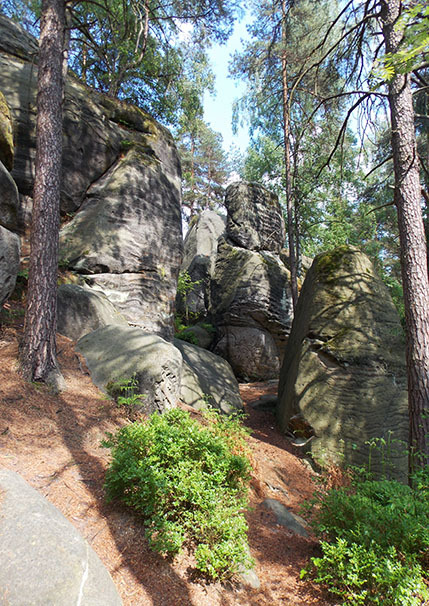 These Rock Towns are part of geoparks scattered across the north of the Czech Republic. Quite often those towns lies close to rivers, palaces or they are on the paths that link different amazing villages. If you could only visit one we would advise you to go to Maloskalsko, in Mala Skála. 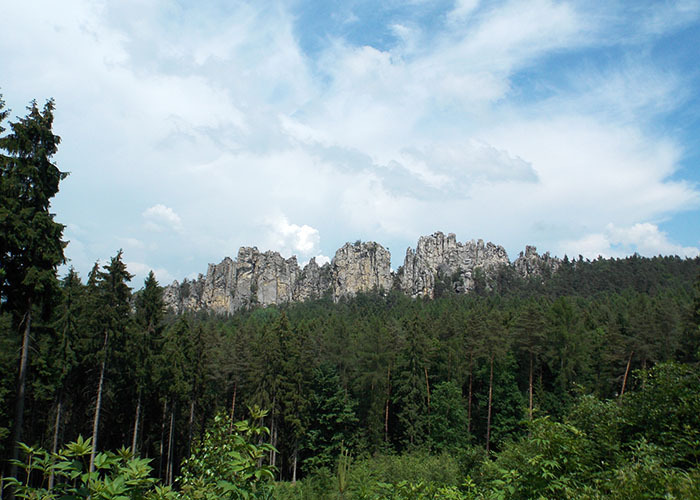 From the valley you can see the giants rock formations; Vranov ridge and Dry Rock. Also from this point you can find walks that take you through the mountain and to the maze of crack formed at Rocks Besedice. The walk we chose to get to the Rocks Besedice was the red trail. It starts from the tourist office, crossing the train track soon after and continue up the mountain. It is well marked. After about 2 kilometers through the forest you will see the signs for the yellow and blue paths, take one of them and let yourself get lost between the cracks that intertwine the different routes, changing from one to another. You can easily sleep with the camper van without any problem. After the walk you can cool off in the river where there is a picnic area. If you prefer to stay in a campsite there is one close by, also next to the river, the price is affordable (about 7 euros a van and 2 people) and the facilities seems to be very good. There are many walking and cycling routes. Also rafting or kayaking if you wish. 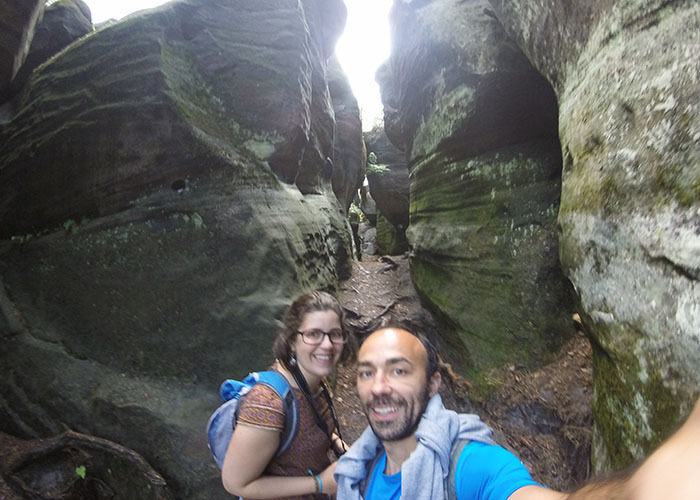 The labyrinth between the rocks is the most authentic among all the Rock Towns. There are not many people. And the girl in the small tourism office is super nice.  The distance between the rock formations of Hruboskalsko, Prachovské skaly and Maloskalsko is not of a great length. With the van you will enjoy a route linking all of them. Have you been in Bohemian Paradise? How was your hike?